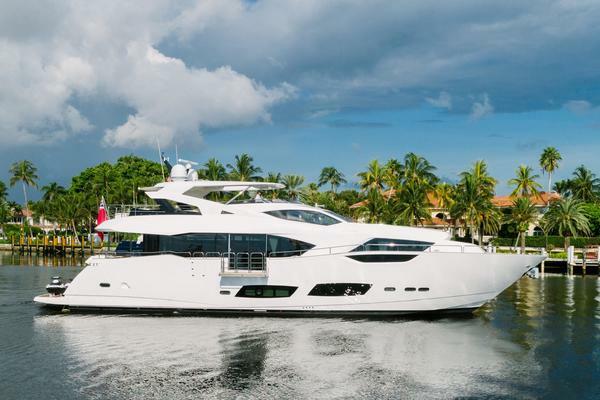 Built in 2007 by British yard Sunseeker, HOOLIGAN is an impressive Predator 82 with a sleek black hull and silver superstructure making her a real head turner everywhere she goes. Finished in satin walnut, her contemporary and sophisticated interior offers accommodation for eight guests in four staterooms, as well as a large salon and dining area with an opening sunroof. She is also commercially registered with Spanish charter licence. Superbly maintained and regularly upgraded including a refit in 2017, this is an excellent opportunity to acquire a sports yacht capable of reaching a thrilling 35 knots. 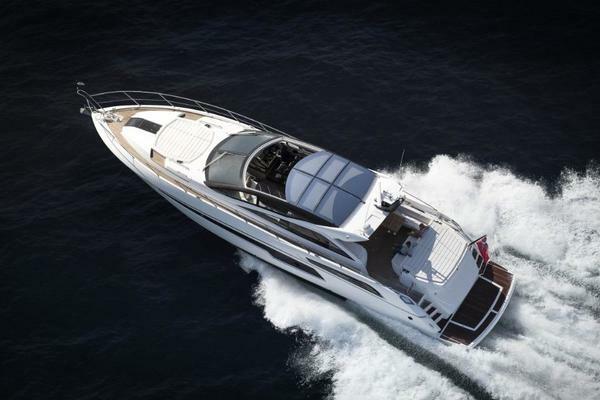 United Yacht Sales New Jersey would love to guide you through a personal showing of this 82' Sunseeker Predator 82 2007. This yacht for sale is located in Palma Spain and priced at $1,150,000. For a showing please contact us by filling out the form on this page and we will get back to you shortly! DIMENSIONSLength o.a: 25.00m / 82’Beam: 6.00m / 19’8”Draft: 1.70 m / 5’7”Displacement: 48.22 tonnesGross tonnage: 62.38 CONSTRUCTIONHull: GRPSuperstructure: GRPDecks: TeakDesigner: Don SheadCLASSIFICATIONClass: n/aMCA: MCA CAT 2PERFORMANCEMaximum speed: 35 knotsCruising speed: 28 knotsConsumption (approx): 500 lph @ 28 knots approx.Range: 500 nm @ 12 knotsMACHINERYEngines: 2 x MTU 12V 2000 M93 1800 Hp (1342 kW) Full analogue engine instrumentation.Soundproofing throughout engine roomEngine hours: 950 hrs each (February 2018)Generators: 2 x KOHLER 23 kW 50Hz17 kW @ 50Hz slow speed KOHLER generator with underwater silent exhaust and sound boxGenerator hours: Port: 1,561 hrs (February 2018)Stdb: 2,107 hrs (February 2018)STEERING & PROPULSIONSteering: Hydraulic power steering from engine driven pump. Power-assisted steering.Propellers: 5-blade propellersGearbox: ZFAUXILIARY EQUIPMENTBow & stern thrusters: SIDE POWER (30 hp)Water maker: - IDROMAR MC3J-180 water maker at 180 l/h with automatic fresh water flush- General Ecology Nature Pure Ultrafine water purifier for the icemaker - Back up fresh water pump, plumbed in with diverter valve for immediate use if requiredStabilizers: Trim tabsFuel separator: Separate fuel filters with water alarmsAir-conditioning: MARINE AIR 100,000 BTU Full air conditioningToilet system: TECMA toilets 24VBoilers: YesOther: - 200 Litre calorifier with 2 x 2 kW immersion heaters- 24V hydraulic pump for trim tabs, gangway and garage door- 7 x AQUA LUMA LED underwater lights- Air Horn upgraded to twin KAHLENBURG- Alternator split charging system- Dinghy Inflator socket 12 volt located in the garageTANKAGE (approximate)Fuel: 5,900 lFresh water: 2 x 573 lELECTRICAL SYSTEMVoltage: 24V and 12V DC electrical system with full circuit breaker protectionFrequency: 50/60 HzShore power: 100 amp Glendinning Cable master - 1 x power feed and recovery 220V AC shorepowercableBatteries: Starter and service batteriesOther: - Dockside connection AC 1 x 63 amp socket- Electrical - Isolation TransformerNAVIGATION EQUIPMENTMagnetic compass: YesLog: RAYMARINEDepth sounder: RAYMARINESonar: RAYMARINEAutopilot: SIMRAD AP 25Radar: RAYMARINE RA1048D 4 kW 48" HD Digital open arrayRadar/chart plotter with GPS (2 x displays)GPS: GARMIN AIS 300Instrumentation system(wind speed & direction): RAYMARINE ST60+Other: - RAYMARINE E125 – 12” Colour touchscreen multifunction display repeater- IMCO navigation lightsCOMMUNICATION AND SATELLITE EQUIPMENTGSM: RAYMARINEBroadband internet: YesVHF: RAYMARINE Ray 260 Class D-DSCVHF handset (dual station)VHF second station handsetTelephone exchange: Telephone points throughout ENTERTAINMENT EQUIPMENTTV/ DVD: DVD - BOSE 321 series II CD/DVD Cinema Surround sound system linked to TVMusic system: - Bose Lifestyle 48 DVD/CD surround system for saloon- Bose upgrade for Aft Cockpit: 4 x BOSE 131 speakers powered by 2 x Bose SA2 amplifiers allowing for Zone control of the Saloon BOSE system with the Bose PMCII remote- BOSE upgrade for Foredeck: 2 x BOSE 251 removable speakers powered by 1 x Bose SA3 amplifier allowing for Zone control of the Saloon - BOSE system with the BOSE PMCII remote- 4 x Marine speakers connected to CD/radio- iPod docking station connected to surround sound systemDOMESTIC APPLIANCES, EQUIPMENT AND LAUNDRY Refrigerator/Freezer: Custom made refrigerator/freezer located between the seating area and port side crew cabin. The top part is a fridge only and the bottom is to be able to be either refrigeration or used as a freezer.Oven: Electric multifunction oven - BOSCH HBN 580650B GB in lieu of standard fittedMicrowave: Yes – BoschDishwasher: Slimline dishwasher AC - BoschWashing machine/Dryer: Yes – Bosch combination machine, ExxcelACCOMMODATION 8 guests in 4 staterooms and 2 crew in 1 cabin + 1 crew in 1 Pullman in crew messSaloonFinished with a satin walnut interior, the large salon and dining area with hard-top features an opening sunroof and large patio-styled doors to the aft cockpit area. The salon and galley are luxuriously appointed and all accented with the signature Sunseeker style.The galley and crew area can be reached by way of an additional staircase situated at the aft of the salon.Modified starboard side seating with slightly extended aft section and slightly shortened forward section. The ends of the sofas are slightly rounded.Special design aft Cockpit table that has four leaves and on an adjustable leg so that it can be used as a low level coffee table when required.Special dining table with chocolate leather inserts.Stainless steel framed sliding patio doors with curtains and tiebacks.Master Stateroom1 x full beam Master stateroom amidships, en-suite.Dressing table with lift up vanity lid and low-back chair.VIP Stateroom1 x forward VIP stateroom, en-suite.Guest Stateroom1 x Double cabin to starboard, en-suite.1 x Twin bunk-bed cabin to port, en-suite.Crew Accommodation1 x Crew cabin with 2 bunk beds, plus 1 Pullman in crew messDECK EQUIPMENTAnchors & chain: 40 kg anchor with 70m of 10mm chain (galvanised)Anchor Winch and capstan upgraded to 4000 W with a 50 kg anchor and 90 metres of 12mm chainPassarelle: Hydraulic BESENZONI telescopic gangwayBathing ladder: Hydraulic swim ladderHydraulic bathing platformStern capstans: 2 x Stern electric capstan winchesforedeck and cockpit controls 24VOther: - Wetbar with ice maker, cool chest and sink with hot and cold water - Wine cooler located in the bar unit forward of the starboard seating- Black mesh screen covers- Chain locker and fender stowage- Deck wash outlets forward and aft- Electric BBQ Grill - GAGGENAU lava coal- Electric Canopy (in grey canvas) for the Aft Cockpit- Electric Helm seat- Pair of retractable cleats for tender on port and stbd corners of platform- Windscreen cover, wipers and washers controlTENDER AND TOYSTenders: Avon Jet 320 Tender with 80 hpToys: - Sea Doo Spark 90 HP for 3 pax- Seabob F5 S- 2 x Stand up paddle boards- Fishing gear- Snorkeling gear- 2 x Donuts- Wakeboard- Water SkisOther: Garage for optional tender and Jet SkiSAFETY & SECURITYLife rafts: YesLife jackets: YesFire–fighting equipment: - Automatic FM200 fire extinguisher with engine/generator and fan shutdown.- Fire Detection System - Yacht fire detection system with sensors throughout the vessel andmonitoring beside the helm position (Lloyds approved equipment)Ship alarms: YesBilge & fire pumps: Automatic bilge and flood pumpManual bilge pumpSecurity cameras: CCTV - Total of two cameras, one located in the engine room and one located on the sternShips safes: Safe x 3 - 2 brickCOMMENTSBuilt in 2007 by UK yard Sunseeker International, HOOLIGAN is an impressive Predator 82 with a sleek black hull and silver superstructure making her a real head turner anywhere she goes. Finished in satin walnut, her contemporary and sophisticated interior offers accommodation for eight guests in four staterooms, as well as a large salon and dining area with an opening sunroof. Superbly maintained and regularly upgraded including a refit in 2017, this is an excellent opportunity to acquire a sporty yacht capable of reaching thrilling speeds of 35 knots.